Large Scale Manufacturing (LSM) in Pakistan shot up 11.3% in the first two months of fiscal year 2017-18, according to the Federal Bureau of Statistics (FBS). It represents a big surge from 5.7% LSM growth seen in Fiscal 2016-17. The broad-based LSM growth was led by 50% jump in iron and steel production and 31% in auto manufacturing sector. Cement production grew nearly 20%, engineering products 19% and Pharmaceuticals 11% in the July-August 2017. Although production was driven mostly by strong domestic demand, the exports in July-Sept 2018 also increased nearly 11% over the same period last year. Among the notable sub-sectors driving strong LSM growth in July-August 2017 are: Tractors 115%, motorcycles 28.3%, deep freezers 16.2%, air-conditioners 26.8%, electric-fans 22.4%, electric motors 17.3% and electric meters 18.3%, and switchgear 20.8%. Significant improvement in the country's security situation is helping restore confidence of investors, businesses and consumers who are pushing economic growth in Pakistan to new highs. The fast pace of execution of China-Pakistan Economic Corridor (CPEC) related projects is at least partly responsible for it. Pakistan's Gwadar: The Next Shenzhen? Fact remains that Pakistan does not have a coherent economic policy that can assure long term steady industrial and agricultural growth. Pakistan (TTP) placing greater focus on Afghanistan. from the peak in 2013.
from terrorism by known groups. Local and foreign investors are bullish and confident on the investment opportunities in Pakistan as they, despite having concerns over policy inconsistency, bet on governance improvement, a survey revealed yesterday. The Business Confidence Index survey, conducted by the Overseas Investors Chamber of Commerce and Industry (OICCI) twice a year, found an 8% improvement in business confidence. The index that considers various indicators found business sentiments 21% positive as compared to 13% recorded in the survey in May. Mansoor advised the government to become more proactive and expedite critical interventions on all issues hindering investment and economic activities including foreign direct investment and export. “There is an urgent need to focus on addressing the country’s very poor rating of 147 out of 190 countries in the recently issued World Bank’s 2018 ease of doing business report, down from 144 in 2016 and way below the 75 rating of Pakistan in 2010,” he said in a statement. The survey is conducted through field interviews in all the four provincial capitals, Islamabad and key business towns across the country. It is a feedback from representatives of all business segments in Pakistan, including retail marketplace, and covers roughly 80% gross domestic product. The Overseas Investors Chamber of Commerce and Industry has 195 members from 35 different countries, representing 14 economic sectors and contributing over one-third of Pakistan’s total tax revenue. The sentiments of the leading foreign investors, represented by the Overseas Investors Chamber of Commerce and Industry members and who participated in the survey, also recorded a 5% increase to 42%. Retail and wholesale trade sector led an upswing with 40% positive sentiment in the survey, up 27% in the six months period. The manufacturing sector followed suit with a 16% positive sentiments, showing a substantial increase of 7%, while the service sector with 15% recorded a marginal decline of 3%. 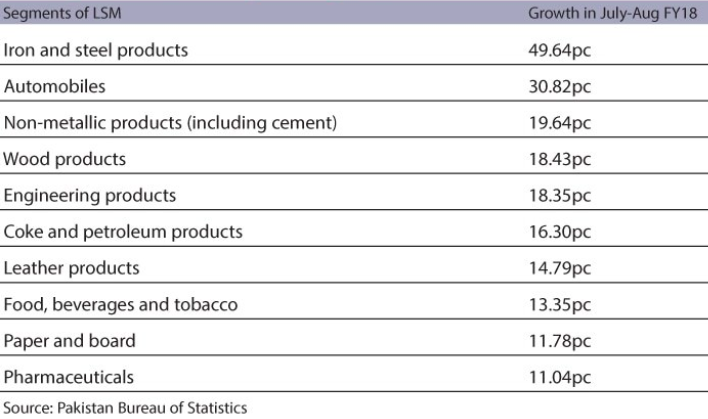 Chemical/cement sector grew 41%, financial services 30%, nonmetallic 23% and food sector 21%. Transport and communication and automobile sectors registered modest growth rates of 12% and 7%, respectively. global perception and business environment as well as an expected rise in capital investment over the next six months. “These views of the survey respondents were largely based on improvement in security, law and order and the overall economy, increased consumer demand, better business alliances, decline in the energy crises and decrease in fuel prices and low inflationary pressure on various other products,” it said. A view of the Karachi city (file). The Business Confidence Index survey, conducted by the Overseas Investors Chamber of Commerce and Industry (OICCI) twice a year, found an 8% improvement in business confidence in Pakistan. From 2002 to 2015 India has been ranked between second and sixth on the Global Terrorism Index. India slipped to 8th position in 2016 but the number of incidents involving terror saw a 16 percent jump. New Delhi (Sputnik) — With a massive jump in terrorism-related incidents, India remains one among the top ten countries most affected by the global scourge. The Global Terrorism Index (GTI) 2017 released by the Australia-based Institute for Economics and Peace said that in 2016, a total of 340 people lost their lives in 929 incidents of terrorism in India which is 16 percent higher in the number of deaths in the previous year. "In the last two years, India's ranking improved to eighth. However, despite the decrease in deaths over the last two years, the number of terror attacks has actually increased. There were 16 percent more attacks in 2016 than in 2015 in continuing the four-year trend of increasing attacks," the report said. The report highlighted the complexities of terrorism-related violence in India as it said that there are a large number of terrorist groups but many are seeking political recognition and so their attacks are not aimed at killing people. Nevertheless, more than half of all deaths were committed by Maoists operating in the eastern, central and the southern areas of India known as the Red Corridor. "The dispute with Pakistan over Jammu and Kashmir remains the main source of Islamist terrorism," the report added. Lashkar-e-Taiba mainly operates in Pakistan and was responsible for 30 deaths increasing from 20 attacks in 2016. On the contrary, Pakistan witnessed a noticeable decline in terrorist activities within its borders which placed it at fifth in the ranking in comparison to fourth in 2015. In Pakistan, the number of people killed in terror attacks fell to 956 last year, a reduction of 12 percent as compared to 2015. "The reduction in deaths from terrorism is in part attributable to Operation Zarb-e-Azb by the Pakistani Army; a military effort which started in mid-2014.This decline reflects a slight decrease in the activity in southeast Pakistan with the Khorasan Chapter of the Islamic State and Tehrik-i-Taliban Pakistan (TTP) placing greater focus on Afghanistan," the report noted. Terrorism-related violence also declined also in Syria, Afghanistan and Nigeria which, along with Pakistan, were four of the five most affected countries. The 2016 terror index places Iraq, Afghanistan, Nigeria, Syria, Pakistan, Yemen, Somalia, India, Turkey and Libya in the first to the tenth position respectively.